HARARE: A career-best 61 from opening batsman Fakhar Zaman set up Pakistan’s imposing 182 for 4 in their tri-series opener against hosts Zimbabwe at Harare Sports Club on Sunday. 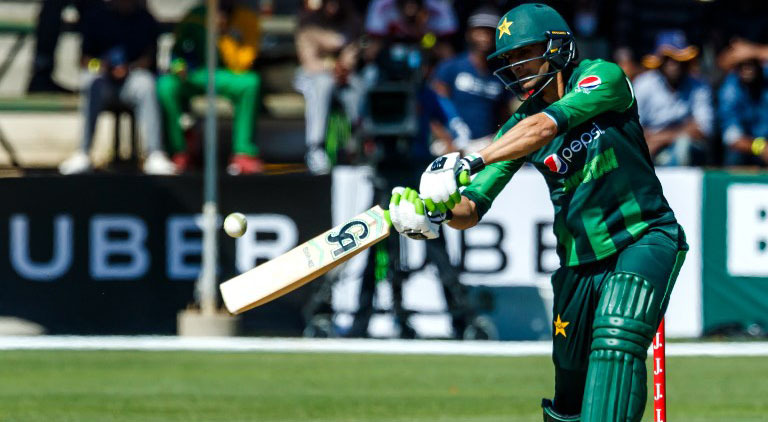 Zaman’s efforts were boosted by a late flurry of boundaries from Asif Ali and veteran batsman Shoaib Malik, who put on an unbroken 62 for the fifth wicket at the death. Zaman kept Pakistan steady through the first half of their innings while Zimbabwe, having opted to bowl first, chipped away at the other end with regular strikes. Mohammad Hafeez, recalled to the Pakistan national team after his bowling action was cleared last month, made just seven runs — including a six –before splicing a big shot down the ground to be excellently caught by new Zimbabwe captain Hamilton Masakadza, backpedalling from mid off. 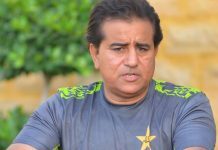 Medium pacer Chamu Chibhabha had Hussain Talat caught behind for a scratchy 10, and when Pakistan captain Sarfraz Ahmed popped a simple catch into the covers off-spinner Tendai Chisoro, Pakistan were 78 for 3. They were helped by Zaman’s fluent scoring at the other end, and he brought up his second T20I half-century from 33 deliveries with a flick through square leg in the 13th over. Zaman appeared settled at the crease, but two overs later he missed a heave at Chisoro and had his leg stump pegged back. Ali and Malik combined to plunder 61 from the last five, including five sixes, as Zimbabwe’s bowlers struggled to contain them. Chisoro, with 2 for 28, and Kyle Jarvis, with 1 for 9 from the two overs he bowled, were the only bowlers to escape punishment. Zimbabwe responded slowly and still required 99 runs off the final six overs as they moved ponderously to 89 for 5 with Tarisai Mukasanda contributing 34.